Preserved in the south of Germany is the romantic town of Heidelberg, a place brimming with rich history and culture. 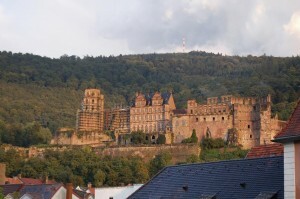 Heidelberg is home to the oldest university in Germany. It has inspired numerous philosophers and writers, such as Goethe and Mark Twain. No matter what sort of European adventure you aspire to have, you will find your niche in this enchanting township. Germany is well known for its beautiful medieval castles that are nestled throughout the country. There are over 25,000 castles! One such estate that an AESU tour will transport you is Heidelberg Palace, located south of Frankfurt. A million visitors flock to this historical site annually to explore this symbol of German Romanticism. Many different styles of architecture can be found within the fortress, as the castle suffered under attacks repeatedly from the French during the Grand Alliance during the 17th century. Fun act about Heidelberg Palace: it is home to the largest wine barrel (7 metres wide, 8 metres long, capacity of 55,345 gallons) in the world! To get that amazing view for a perfect photograph to add to your travel scrapbook, the best spot to capture an image of the town requires a hike up to the Philosophenweg. If you need a break on this steep journey- don’t worry, there are benches along the way to allow for a short rest! Once you reach the top and have snapped photographs to your heart’s content, wonder along a few of the nature paths to enjoy more scenic views. 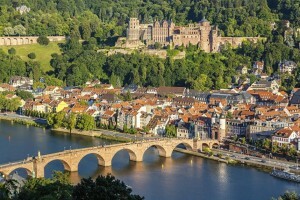 Why not pack a picnic and take it with you to have while overlooking picturesque Heidelberg? Be sure to check out all of our great Travel Tips for Germany and the Travel Tips for Europe before you head overseas. This entry was posted on Thursday, February 20th, 2014	at 1:54 pm	. You can follow any responses to this entry through the RSS 2.0	feed. Both comments and pings are currently closed.